Or so Athena thought. But then the feathers started sprouting beneath her skin, invading her lungs like a strange cancer, and Hermes showed up with a fever eating away his flesh. So much for living a quiet eternity in perpetual health. Desperately seeking the cause of their slow, miserable deaths, Athena and Hermes travel the world, gathering allies and discovering enemies both new and old. Their search leads them to Cassandra—an ordinary girl who was once an extraordinary prophetess, protected and loved by a god. These days, Cassandra doesn’t involve herself in the business of gods—in fact, she doesn’t even know they exist. 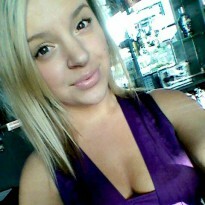 But she could be the key in a war that is only just beginning. Because Hera, the queen of the gods, has aligned herself with other of the ancient Olympians, who are killing off rivals in an attempt to prolong their own lives. But these anti-gods have become corrupted in their desperation to survive, horrific caricatures of their former glory. Athena will need every advantage she can get, because immortals don’t just flicker out. Every one of them dies in their own way. Some choke on feathers. Others become monsters. All of them rage against their last breath. 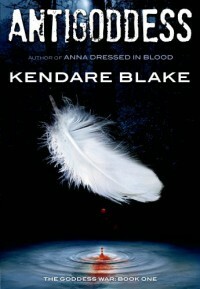 This is my first Kendare Blake novel, and I have to say it did not disappoint. Going into AntiGoddess I had NO idea what to expect, but was pleasantly surprised that I actually quite enjoyed this. Lets go ahead and get what I didn't like out of the way. First off the beginning was a little slow pace in my opinion. It wasn't necessarily boring, but it was slow. Also in the beginning it's confusing as to what's going on, things start to piece together a little ways in though so don't worry. Basically the beginning of AntiGoddess for me was not all that great. Also while I did like the variety of characters, and their relationships with one another I didn't find myself caring all that much for them. I liked them, but just couldn't get myself to care about them.